A savory blend of seasoned rice and chicken in a savory sauce accented with pimentos and just a hint of pepper and onion create a perfect meal. What could be better in the great outdoors? Compact Vacuum Pouch Won't expand at high elevations Takes less space in your backpack. A good addition to your emergency food storage or 72 hour kit. Inside you will find the same great tasting food as in the larger pouches. Just add boiling water, wait a few minutes, and enjoy. 2. Carefully add 1 3/4 cups (14oz) boiling water to pouch. 3. Stir thoroughly and close zipper. Let stand 8-9 minutes. Stir and serve. Enjoy as a filling or eat right out of the pouch. *The enclosed oxygen absorber contains powdered iron oxide to ensure product freshness. 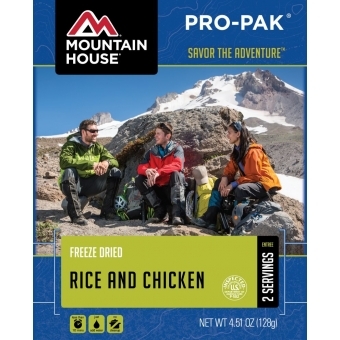 Ingredients: Precooked Enriched Rice (enriched with niacin, iron [ferric orthophosphate], thiamine mononitrate, folic acid), Cooked Chicken (chicken meat, salt), Corn Oil, Pimientos, and Contains 1% or Less of Modified Corn Starch, Hydrolyzed Vegetable Protein (corn soy, wheat gluten) Sea Salt, Chicken Fat, Sugar, Onion Powder, Spices, Seasoning (maltodextrin, natural flavor), Citric Acid, Soybean Oil, Turmeric, and Spice Extract.